At last ... a Honey Roasted Peanut fine enough to be called our own. Each batch is perfectly coated with pure honey and a dash of salt. 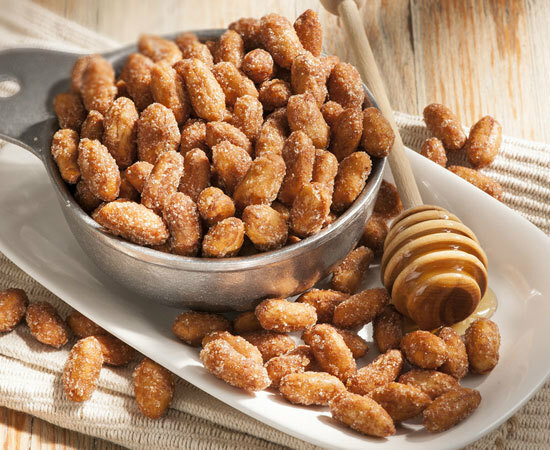 Our Honey Roasted Peanuts will become a favorite of yours ... fast! [GF]Contains no gluten ingredients. [U] Kosher certified. My Brother and Sister-in-Law live there in Williamsburg. They sent us some of your Honey Roasted Peanuts for Christmas. These peanuts had a fantastic flavor. The best we've ever eaten. My wife and her mom and sisters were on a road trip and stopped at your shop. Knowing how I love Honey Roasted she brought me a small tin home. THESE ARE THE BEST I HAVE HAD, EVER! AWESOME! It seemed impossible to find honey roasted peanuts that are the right balance of flavor *and* have no weird chemicals added to ruin it - until I found these. Well done, Williamsburg. Well done. Honey, we love these nuts! They are crunchy and not too sweet.